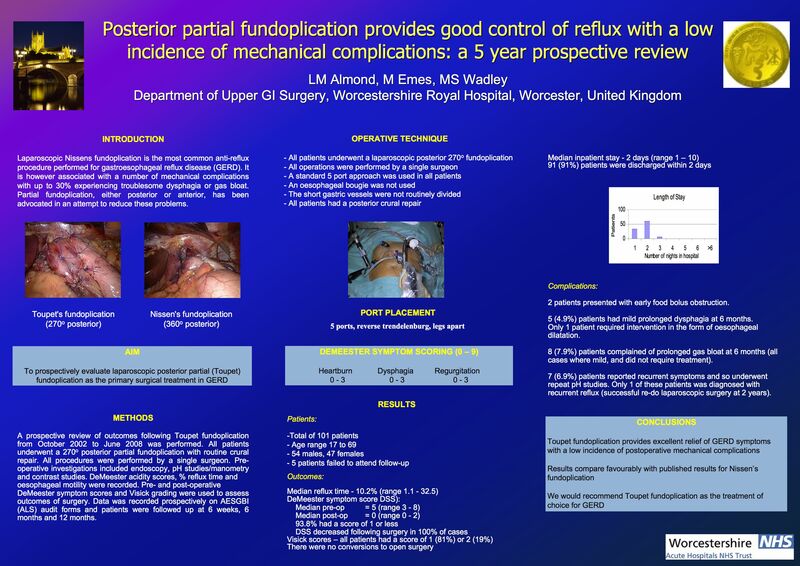 Posterior Partial Fundoplication Provides Good Control of Reflux with a Low Incidence of Mechanical Complications: A Prospective Review. Introduction: Laparoscopic Nissens fundoplication is the most common surgical procedure performed for gastroesophageal reflux disease (GERD). It is however associated with a number of mechanical complications with as many as one in three patients experiencing troublesome dysphagia or gas bloat . Partial fundoplication, either posterior or anterior, has been advocated in an attempt to reduce these problems. Our aim was to prospectively evaluate laparoscopic posterior partial fundoplication (Toupet) as the primary surgical treatment for GERD. Method: A prospective review of outcomes following Toupet fundoplication from October 2002 to June 2008. All patients underwent a 270o posterior partial fundoplication with routine crural repair. All procedures were performed by a single surgeon. Pre-operative investigations included endoscopy, pH studies/manometry and contrast studies. Demeester acidity scores, % reflux time and oesophageal motility were recorded. Pre- and post-operative Demeester symptom scores (0-9, DSS) and Visick grading were used to assess outcomes of surgery. Results: 101 patients were studied. Ages ranged from 17 to 69 years. Median pre-operative DSS of 5 fell to a median of 0 post-operatively. Scores decreased following surgery in all cases. 91 (91%) patients were discharged on the 2nd post-operative day or sooner. 5 (4.9%) patients had prolonged dysphagia (>3 months), and 8 (7.9%) had mild prolonged gas bloat. A single patient had a recurrence of reflux and required re-do laparoscopic surgery at 2 years. There were no conversions to open surgery. Conclusions: Laparoscopic Toupet fundoplication provides excellent relief of GERD symptoms with a low incidence of postoperative mechanical complications. We would recommend it as the operation of choice for GORD.